First published in 1984, this story has been in print ever since. At the end of the last Ice Age a hunting accident leaves a small family group trapped – and winter is coming. 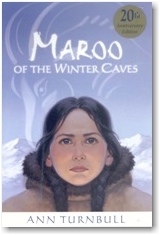 Maroo and her brother, sent to fetch help, must follow the dangerous and spirit-haunted trail across the White Mountain.